Pizza takeaway on the High Street, with half a dozen tall stools for eat-in. It opened in early 2019. It was vacant and advertised to let as of July 2012 photo, and still vacant as of November 2014. However, as of February 2015 signage had appeared photo for a new business called Everyday's. The related planning application included no details of what Everyday's would be, but a photo taken through the window suggested some kind of casual restaurant or cafe. Everyday's opened in late February or early March 2015 photo, serving burgers, chicken, pizza, Indian food, and ice cream. As of March 2015 it also did delivery between 5pm and 11pm within a 3-mile radius for orders of £12 or over, with online ordering via Hungry House. It closed some time in June or July 2015, shortly after opening another branch at 136 North End. According to a manager at the North End branch in early August 2015, the plan was to keep the North End branch open as Everyday's, while the High Street branch would reopen soon as an American grill, with different management but using a few recipes from the Everyday's team. As of August 2015 it was due to open photo as a branch of Rodeos American grill. As of January 2016 this still hadn't happened, though we had seen people doing work on it over the past few months. As of February 2016 the interior still didn't seem close to being ready photo 1, photo 2, and as of March 2016 the Rodeos sign had vanished and the building was advertised to let photo. It was still vacant as of September 2016. As of December 2016 there was a sign in the window photo stating that a "Brazilian Grill Restaurant and Bar" had applied for a license to provide live music, late night refreshments, and alcohol at the premises. As of March 2017 it was still vacant but there seemed to be work going on inside. The abovementioned Brazilian restaurant opened around April or May 2017 under the name Rodizio Grill photo, but rebranded to Barril Grill some time between October 2017 and June 2018 photo. We never saw it open after the rebranding, so didn't have a chance to ask whether the management changed as well as the name. 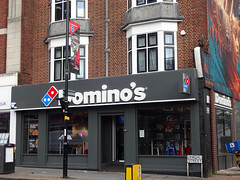 As of December 2018 the interior had been stripped out and a planning application had been granted for Domino's signage. The new Domino's was open by the end of March 2019. Existence last checked in March 2019. Last edited 2019-03-26 17:42:37 (version 63; diff). List all versions. Page last edited 2019-03-26 17:42:37 (version 63).